The Way Huge Supa-Lead Overdrive is a dynamic and touch sensitive overdrive pedal that cleans up immediately as you lower the guitar volume control. Designed to get amp-like crunch tones from a clean or slightly dirty amp, it produces a focused midrange grind with an abundance of output volume to kick your amp over the edge. 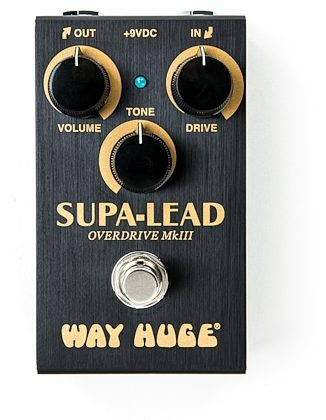 Use the large sweep of the Tone control to dial in the perfect warmth, and with the Gain knob turned up, you'll get a sonically monstrous sound that's reminiscent of an exploding tube amp stack with large grain power saturation and hints of cone cry. Ride your guitar's Volume knob or change up your picking dynamics for a cornucopia of tones from delicate to volcanic. zZounds is an authorized dealer of Way Huge Electronics products.